Synopsis: It is ten years after an aging Batman has retired, and Gotham City has sunk deeper into decadence and lawlessness. Now, when his city needs him most, the Dark Knight returns in a blaze of glory. Joined by Carrie Kelly, a teenage female Robin, Batman takes to the streets to end the threat of the mutant gangs that have overrun the city. And after facing off against his two greatest enemies, the Joker and Two-Face, for the final time, Batman finds himself in mortal combat with his former ally, Superman, in a battle that only one of them will survive. Review: The Dark Knight Returns paints a phenominal picture of a tortured and hollow Bruce Wayne, trying desperately to keep the promise that had set the Batman into retirement for the past decade. Now, with the mutant gang escalating their violence and Harvey Dent on the lamb, Bruce is pushed over the edge mentally and emotionally...and he must bring back the Bat. 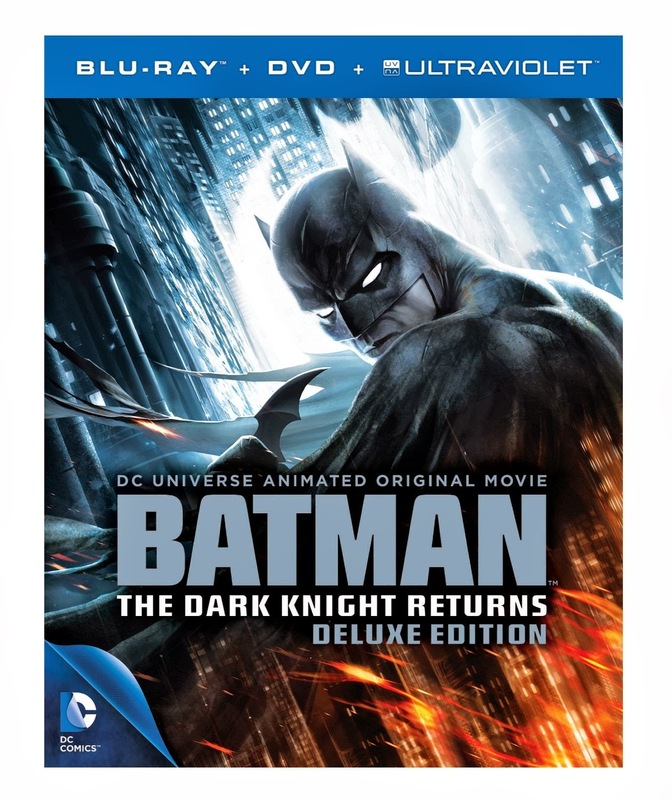 Its truly a thing of beauty to watch as the animators bring the Bat back into this grim and dark Gotham. He attacks from the shadows, sharp and brutal..just the way all good fanboys wish for. The theme music is very Nolanesque and the action is intense. They do a wonderful job of bringing this very 80s themed tale into the modern age. Peter Weller's portrayl of the Bat is gritty, dark and grim. Exactly what you'd imagine when reading the comics. 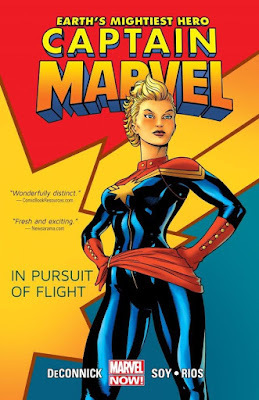 Its funny...as a kid and an adult fan I've read through the graphic novel dozens of times..it changed the way I viewed comic books. And I figured watching this would be a little dull, since I am so familiar with the story....but they did such an amazing job of bringing this epic tale to life that I was riveted to the screen. This is one of the best animated adaptations of Batman to date. This new release combines parts one and two into one long animated feature with some great special features and pack-in art cards. This is the ultimate collector's edition. Target has their own exclusive steelbook version of the feature. You can see the cards included with all versions in the pic below with the Steelbook! 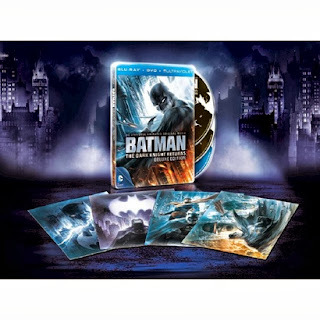 This seamless combination of the heralded two-part "Batman: The Dark Knight Returns" is accompanied on the Blu-ray Combo Pack by several new bonus features, including a 70-minute Frank Miller retrospective, an all-new filmmaker commentary, four exclusive collector cards with never-before-seen artwork, and all of the extra content originally found on the original Part 1 & 2 releases. Fatman on Batman Podcast Posts 50th Episode! Beware the Batman is NOT Cancelled! TMNT Target Holiday Toy Ad! DC Superheroes Movies 3-Pack DVD Out Today! Win a copy of Shrek: The Musical on Blu-Ray! Win a copy of The Heat on Blu-Ray! Classic TV on DVD titles out tomorrow!! Beware the Batman's Man-Bat Revealed! NYCC: New DC Total Heroes Mattel Toyline! NYCC: DC Universe Batzarro Figure! New Batman 89 & Batman Returns 4" Figures Coming! Win a copy of Drug War on Blu-Ray! New Toy Story Buzz Costume at Target! 1966 Batman Classic Halloween Costumes! House of Wax 3D Blu-Ray Review! Beware the Batman "Instinct" Pics and Video!